Kerala had witnessed protests over the entry of women at Sabarimala temple in the wake of a Supreme Court order lifting age restrictions at the shrine. “If UDF and LDF think they can destroy our faith, they are mistaken. Their disgusting mischief will not be able to destroy our traditions. Till the BJP is there, the LDF and UDF will not be able to destroy the traditions of Kerala. I want to say it clearly that the BJP stands with Kerala, BJP stands with our faith,” Modi said. 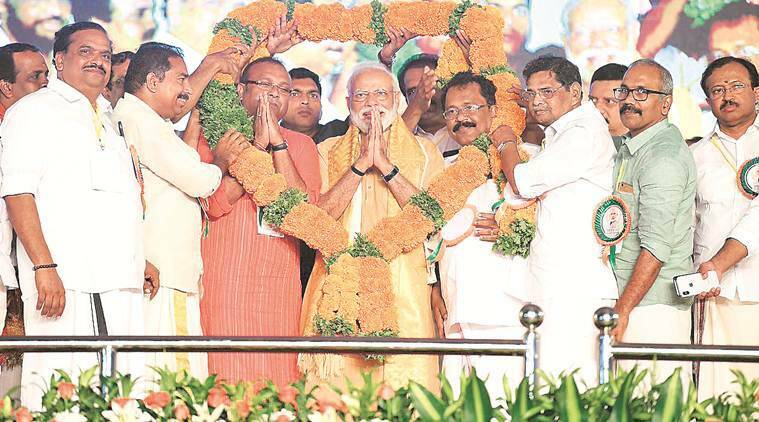 In tune with the party promise in the election manifesto, Modi said the BJP would make all efforts to present the century-old traditions and rituals in Kerala before the Supreme Court. The Union government would take steps to ensure constitutional protection for issues related to faith and traditions, he added. Modi accused the communists and the Congress of double standards on women empowerment. The so-called defenders of women’s rights were the ones who stood for the practice of triple talaq, he alleged. Attacking the CPM-led LDF and Congress-led UDF, Modi said that for decades, the communists and the “communal” UDF dominated Kerala politics but failed the state. “The BJP presents an alternative that is inclusive, democratic and compassionate. We will serve each and every citizen. UDF and LDF are different only in name, in deeds they are the same. Both have taken turns to loot the state,” he said. Referring to the recent Income Tax searches in Madhya Pradesh, Modi said, “Now the entire country is speaking about a national scam of the Congress. This is the Tughlaq Road election scam. In MP, crores of rupees and bags of cash have been found and a detailed probe revealed that the money trail reaches the house of a top Congress leader in Delhi’s Tughlaq Road. Do you know who is staying at Tughlaq Road in Delhi?” He said the money that was looted was meant to provide nutrition to women and children. During a rally on Thursday, Karnataka CM H D Kumaraswamy had accused the PM of playing with the lives of soldiers by trumpeting the work of the Army for political gain. He said many personnel — like CRPF constable H Guru from Mandya who was killed in the Pulwama attack — come from poor families and join the Army to help their families as well. “The PM is using patriotism of soldiers for his gain,” Kumaraswamy said on Friday in a reaction to the PM’s speech. At another rally in Maharashtra’s Ahmednagar, Modi questioned NCP chief Sharad Pawar’s silence over the NC’s remarks on a separate Prime Minister for J&K. He slammed the Congress-NCP combine for allegedly “supporting” those who advocated separation of J&K from India. “I do not have any expectation from the Congress, as they are known to promote such separatist ideologies. But what happened to Sharad Rao Pawar?” he said.